In the remote western Tibet, the holy peak Mount Kailash (6714 meters) dominates the entire region’s landscape. The celestial beauty of Mount Kailash is not only fascinating, it is also the ultimate pilgrimage destination for four religions Hindu, Buddhist, Jain and Bon from around the world. For all four religions, Mount Kailash is the spiritual epicenter. Every year, thousands of devotees make the pilgrimage tour to the holy mount Kailash for spiritual purification. Taking holy bath at Lake Manasarovar and involving in three days Kailash circuit known as Kailash Parikrama is major activities of those pilgrimage peoples. Other peoples also visit the area to explore its beauty and high adventure. Reagon is specially control by Nagri government of Tibet. to Reach there, every foreigners other than Tibetan have to buy travel packages. Special travel permit and visa is required. The best season to reach there is from month of May till month of October every season. Special Kailash Tour is also operate by Nepal Highland Treks. Major and ligal entrance points to Mount Kailash and Lake Mansarovar is from Lhasa Tibet, Kerung near Nepal Tibet boarder, Nathula via India and Taklakot Nepal Tibet boarder. In Hinduism, the Mount Kailash is known to be the abode of Lord Shiva where he lives with his consort Parvati and other gans. He resides on the peak in the state of meditation. Vishnu Puraan describes Kailash four faces are made of crystal, ruby, gold and lapis. The pilgrims do parikrama (Kora or Walking around Mount Kailash) in the clockwise direction starting from the South face. It is believed that doing one time parikrama is equivalent to turning one round of wheel of life. The mountain is the pillar of the world and the entire universe is operated from this place. Mount Kailash North Face. This view is from Derapuk reach after fist day of Kailash Parikrama. Buddhist have different name of Mount Kailash. 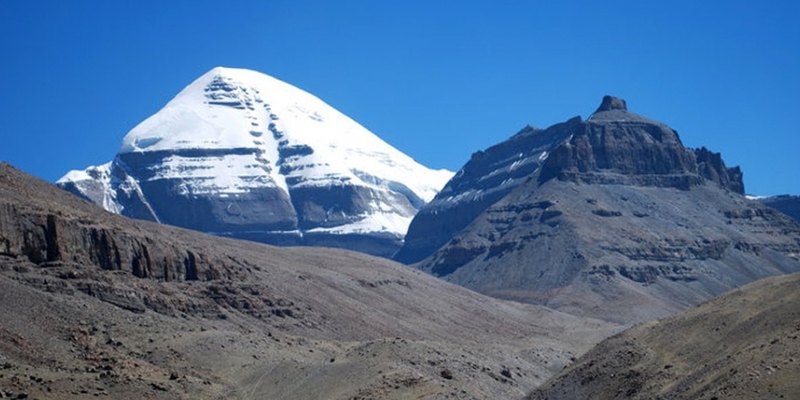 Buddhists have named Mount Kailash Garu Rimpoche, meaning “precious jewel of snow” and a gigantic mandala. According to the legend it is the abode of Chakra Samvara and Guru Rinpoche – Padma Sambhava, who brought Buddhism to Tibet and beyond.. Mount Kailash is the major pilgrimage site in Buddhist traditions. This is the place where Buddha represents supreme bliss. It is said that Milarepa (Buddist saint) the only person of pure soul who could reach on the peak of Kailash riding on the sun rays. Like Hindus, the pilgrims do Kora in the clockwise direction starting from Yam Dwar facing south face of Kailash. At just 6,714 meters above sea level, the mountain is far from being one of the highest mountains in Tibet, yet it has never been climbed by modern man, and it is likely that it never will be due to its unique religious significance.